Bruce, an accomplished oil painter, is passionate about finding ways to incorporate graphic imagery into civics education. Throughout his career as a lawyer, Bruce Petrie has always had a painting underway on the easel. In his third floor studio at home, hundreds of used oil paint brushes in all shapes, colors and sizes are stacked in long rows on a worktable. "I never throw one out," he says. "They've been good tools and are like trail markers of past effort." His picture-making started at an early age and is still going strong: childhood cartoons and caricatures, followed by magazine illustration and newspaper editorial cartooning; then academic study of drawing and painting and hours of painting outdoors throughout the US and overseas. "The arts are about connection," Bruce says, "between an inspiration and a picture, between the work and the viewer, between what we see out there and the canvas, between people and ideas." "I used to think that the arts and the law were separate worlds. But after doing art and law side-by-side, the two interests began to connect. Inspiration is important to lawyering no less than painting. Law and painting involve composition, or persuasive communication of a viewpoint. Also, principles of balance are central to art and law, whose symbol after all is scales. And both art and law require selective emphasis and craftsmanship." Cincinnati's thriving arts culture has been one of the many reasons he feels connected to the Midwestern place where he and Mimi, his wife of 38 years, have raised twin daughters and two sons. "Cincinnati is experiencing a civic renaissance," he says. "Our community, neighborhoods, businesses and civic culture are stronger because Cincinnatians love and support the arts." On the Board of the Cincinnati Art Museum, a founding member of the Greenacres Artists Guild and a medalist member of Oil Painters of America, Bruce believes Cincinnati's national reputation as an arts-friendly city is growing. Bruce believes the arts have a unifying, civic role to play in times of national division. He sees the art/law connection as a way to help citizens better understand what he calls "America's best masterpiece": the US Constitution. He teaches an undergraduate course called "Constitutional Conversation" in which students discuss the many ways the Constitution influences our civic lives. "Seeing the Constitution, not just through the lens of divided politics or hyper-legalism, but more broadly through the lens of culture and the humanities is a way to connect We the People and the next generation of citizens around the values and ideals that hold us together. I think that's what forming a more perfect Union means after all." Bruce's versatile legal practice includes: health and elder care; education; labor and employment; constitutional and art law. As an advocate, he has argued cases before courts at every level of Ohio's judicial system, a wide variety of state and federal administrative agencies, and federal district and appellate courts. As a lead negotiator and spokesperson, he has successfully negotiated many collective bargaining agreements for schools, hospitals, elder care organizations and businesses. As outside general counsel, he works with leadership teams and boards of trustees on day-to-day problem solving, legal advice, policy development, risk management, personnel problems and high-stakes strategic and legal decisions. He has extensive experience in arbitration, mediation and dispute resolution. In health care, he advises physicians, dentists and other health care professionals on practice transition, employment agreements, compensation and non-competes. In education, he represents public and private schools, colleges and universities, parents, students, and others in the full range of education law issues. He is the Chair of the Graydon Education Group. He has been selected for Best Lawyers in America and has the highest AV Preeminent Rating from Martindale-Hubbell. 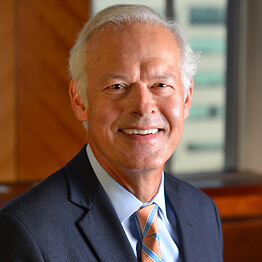 He is the author of three legal books: Constitutional Conversation: A New Lens on America's Best Masterpiece ; Healthcare Labor and Employment Practice Guide; and Innovations in Ohio Workplace Law. He teaches Constitutional Law as an adjunct professor at Miami University and University of Cincinnati. His background in constitutional history includes study at Brown and Northwestern. Bruce is an oil painter and illustrator (see www.brucepetrie.com), a medalist member of Oil Painters of America, a founding member of Greenacres Artists Guild and a Member of the Board of the Cincinnati Art Museum. He is the author of a book on oil painting: Trail of the Brush: A Painter's Guide. He serves the visual arts community with advice related to art and museums. He has been president and/or in executive leadership of a number of civic and community boards. He and his wife Mimi (Dr. Mary B. Petrie) have four adult children. People > Bruce I. Petrie, Jr.